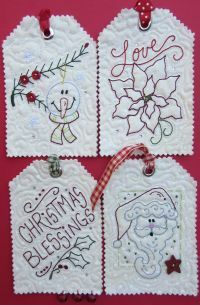 Large size: 4" x 6"
Use your embroidery machine to stitch these quick tags to add a touch of spectacular to your holiday gifts! 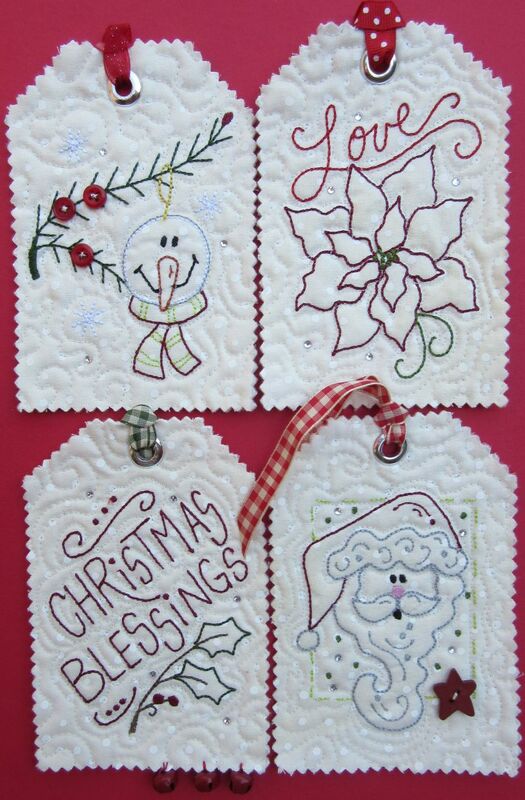 You can also make gift card holders, ornaments and luggage tags. All of the designs are included in two sizes to enjoy! 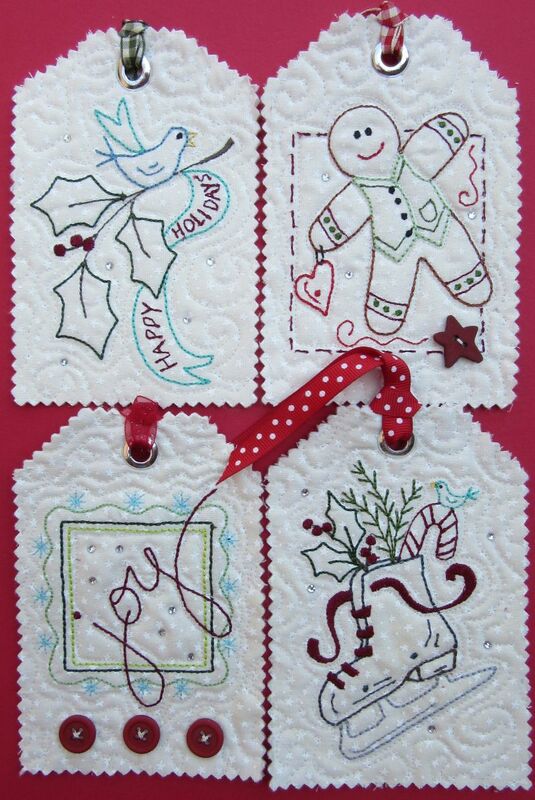 Use your embroidery machine to stitch this second set of fun holiday designs! 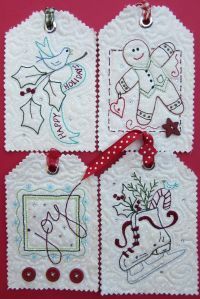 These designs are included in 2 sizes to make fancy tags, mini wall hangings or creative Christmas cards. Use your imagination and go crazy! 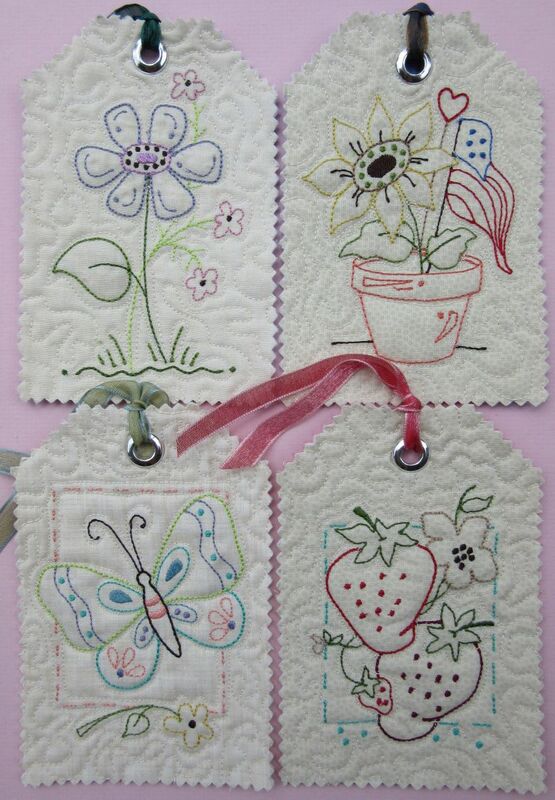 Use your embroidery machine to stitch these quick tags included in 2 sizes. You can use these as gift , luggage and wine bottle tags. They would also make great gift card holders, decorate a little bag or a great framed piece! I love to garden and watch plants bloom! Geraniums are one of my favorites! Use your embroidery machine to make quick work of this cute tribute to summer. There are 3 sizes of the design included! Oh Fall! 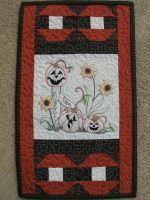 Pumpkins and sunflowers always mean that cool weather is near. 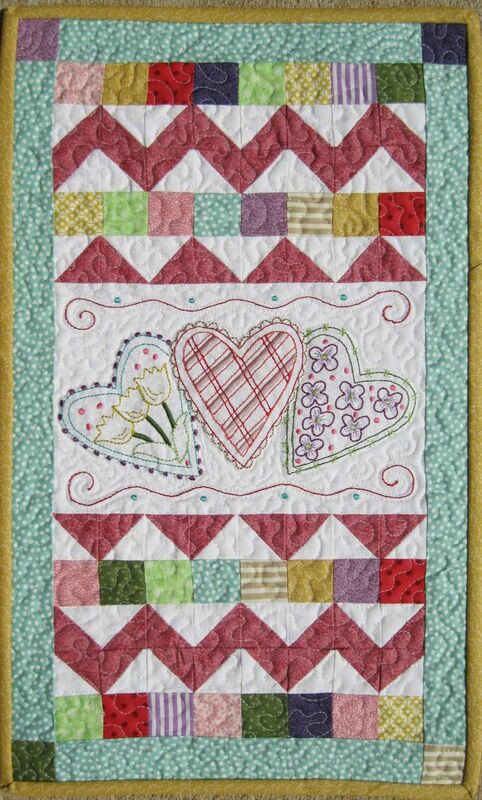 Use your embroidery machine to stitch this mini quilt design in 3 sizes! 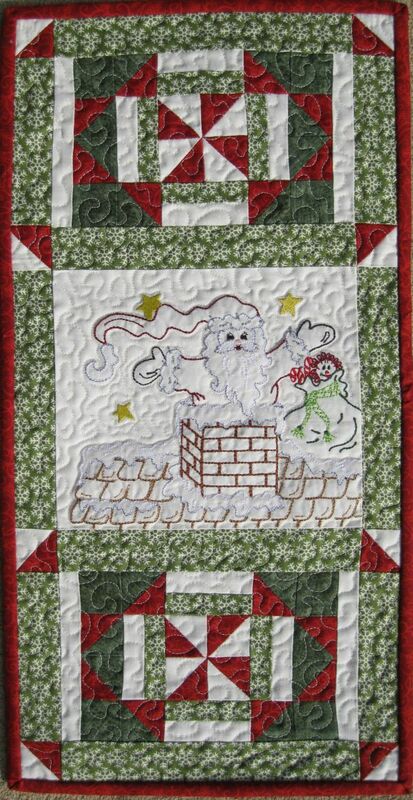 Give your winter a little sparkle with this fun mini quilt! Use your embroidery machine to stitch this cutie in 3 sizes. The tag size is included for added fun! Small 3 1/2" x 4 1/4"
Medium 4 1/2" x 5 1/4"
Oh yes, coneflowers! My garden is complete. Use your embroidery machine to stitch this cutie quick in 2 sizes. 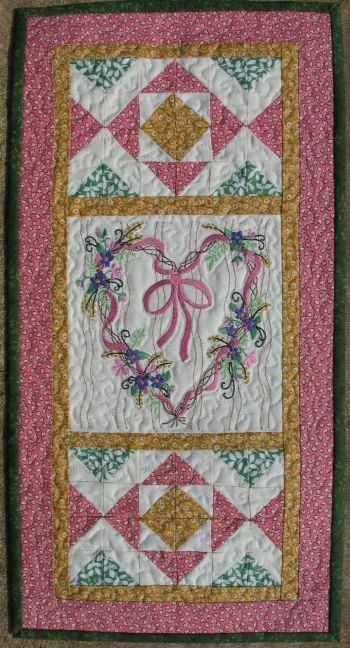 Small 4 1/2" x 4 1/2"
This design is perfect for any small spot that needs a touch of spring! 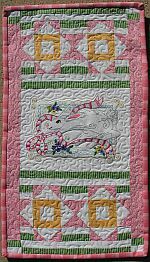 Use your embroidery machine and finish it quick. This designs are included in two sizes to enjoy. These are the cutest skaters you will ever stitch with your embroidery machine! There are 3 sizes included to enjoy. Stitch the small size to make the sweet tag pictured. Small 3 1/4" x 4 7/8"
Medium 4 1/4" x 6 1/2"
Large 5 1/8" x 7 7/8"
Spring has sprung and the butterflies happily abound! Use your embroidery machine to stitch this great mini to celebrate the spring color. The designs are included in several sizes! Small 2 3/8" x 3 3/8"
Large 2 3/4" x 3 7/8"
Small 4 1/8" x 4 3/4"
Medium 4 7/8" x 5 3/4"
Large 5 1/4" x 5 7/8"
These cute smiles will make your holiday joyous! 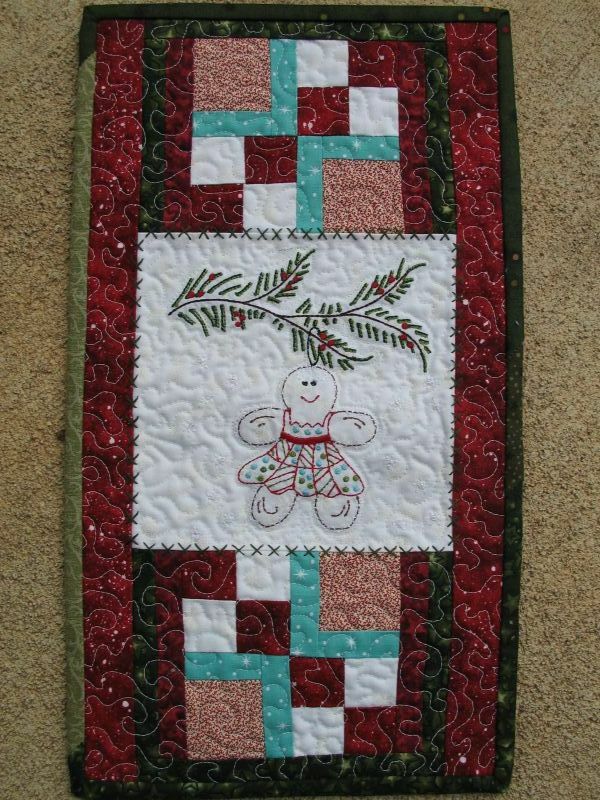 Use your embroidery machine to stitch, then piece and enjoy! There are 3 sizes included to play with. 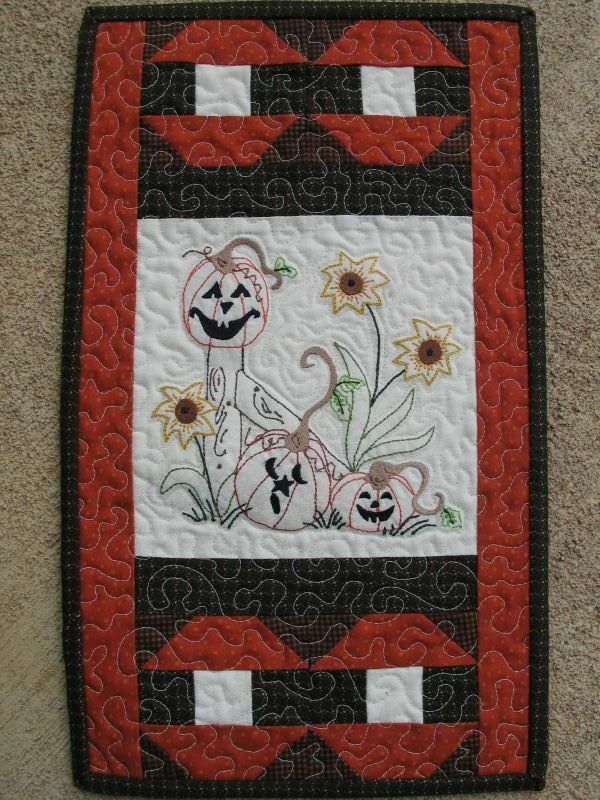 Large 5 1/4" x 7"
Medium 4 7/8" x 6 3/8"
Small 3 3/4" x 4 7/8"
Everyone loves the colors of October! The mums are in bloom, the leaves are dazzling and the bittersweet is blazing. 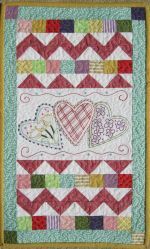 Use your embroidery machine to create all of these loves in one! There are 3 sizes included to spread the love. 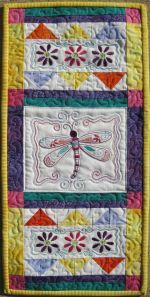 Large 5 1/4" x 8 3/4"
Medium 4" x 6 3/4"
Small 3 3/4" x 5"
Use your embroidery machine to stitch these sweet dragonfly and flower blocks. 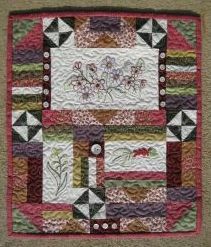 You can use batiks or spring prints to set it all together. 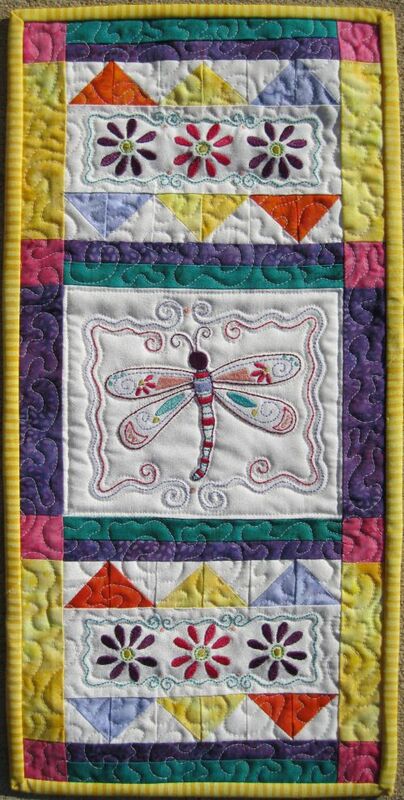 The dragonfly block is included in 2 sizes and will fit a 5" x 5" hoop. 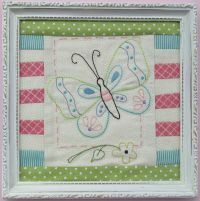 Flower block measures 1 3/4" x 5"
Small dragonfly block measures 3 7/8" x 5"
Large dragonfly block measures 4 3/4" x 5 1/4"
This little beauty is quick to stitch using your embroidery machine and easy to enjoy! 4 designs are included. The top flower design is included in 2 sizes. Small top flower measures 3" x 4 3/4"
Large top flower measures 3" x 5 1/2"
Left flower measures 1 1/2" x 3 1/4"
Right flower measures 1 1/4" x 3 1/8"
Use your embroidery machine to stitch these sweet buddies and make a cute mini. 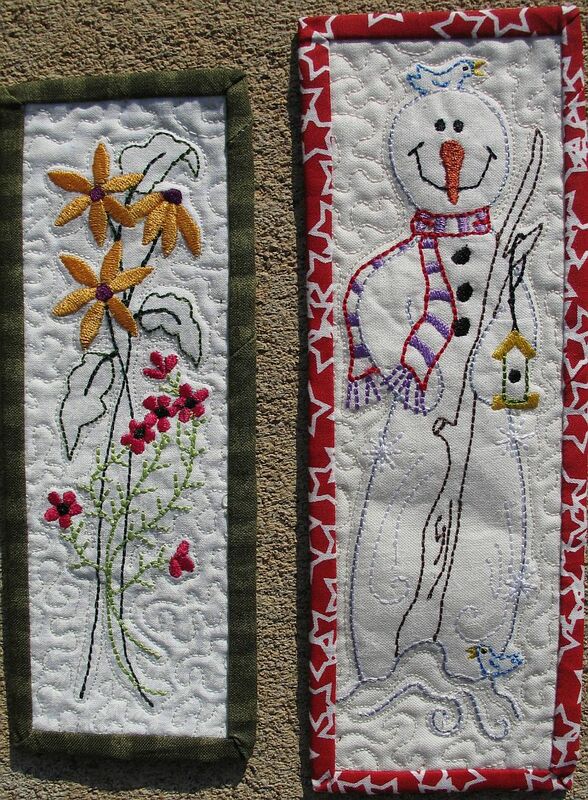 The snowmen are included in 2 sizes and will fit a 5" x 5" hoop. 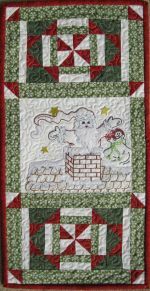 Small snowmen design measures 3" x 4 3/4"
Large snowmen design measures 3 3/4" x 6"
Snowflake single measures 1 3/4" x 2"
Snowflakes (2 in the hoop) measures 1 3/4" x 5"
Use your embroidery machine to stitch this cute Christmas favorite! Design fits a 145mm x 255mm oval hoop for a 5 1/2" x 6 3/4" design. A snowman and stars, two of my favorite things! 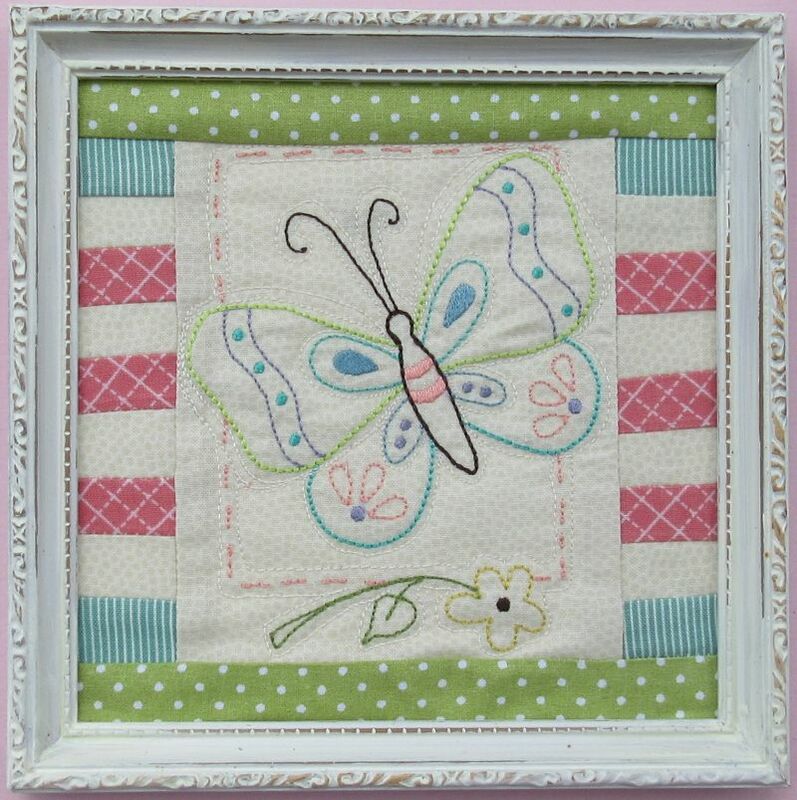 Use your embroidery machine to stitch out this cutie and hang it in any small spot and enjoy! 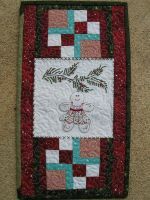 Design measures 4 1/2" x 5 1/2"
Use your embroidery machine and stitch this cute bouquet of fall colors! 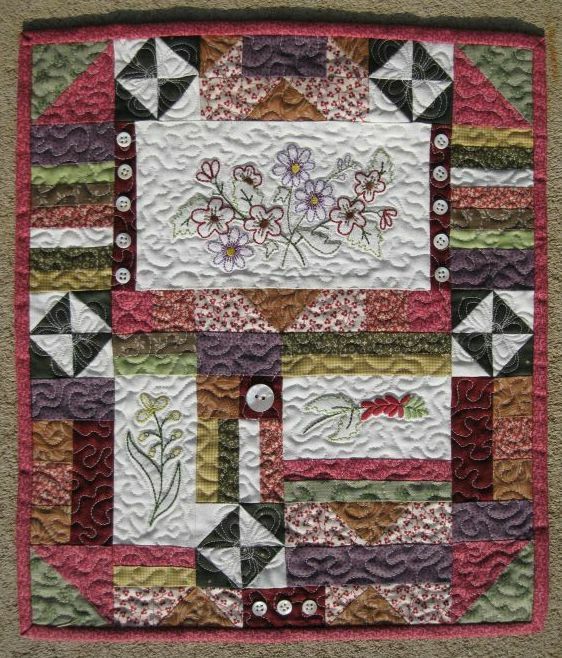 Leaf design measures: 3 1/2" x 5 1/2"
Bouquet design measures 5 1/2" x 5 1/2"
Oh, isn't it just loverly and easy to stitch using machine embroidery. 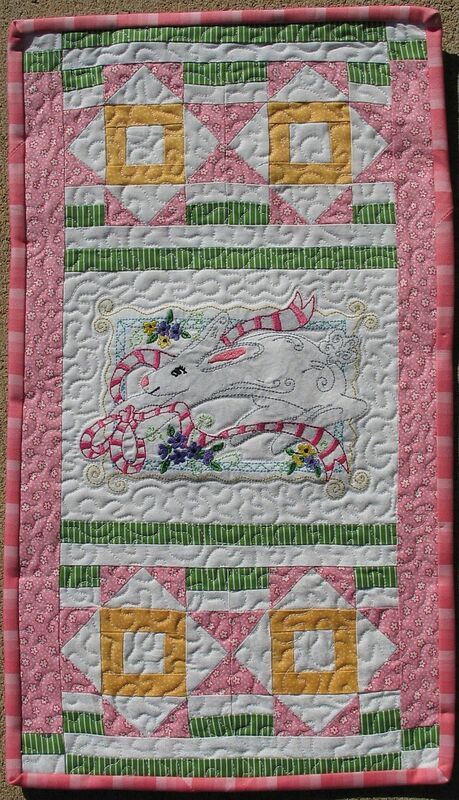 Design measures 4 1/2" x 7 1/4"
Use your embroidery machine to stitch Bella the bunny and welcome Spring! 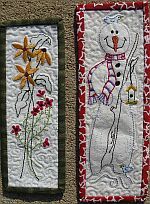 Design measures 5" x 7 1/4"
Frosty finished size 3"x 8 1/2"
Use your embroidery machine to stitch these sweet bookmarks. They make great, quick gifts! 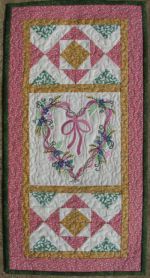 Use your embroidery machine to stitch this precious little heart and then piece it together in the colors that warm your heart. Design measures 5 1/2" x 6"
This cute little fence corner will add the joy of Fall to any small space. Use your embroidery machine and make it quick! 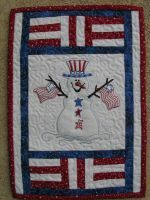 Design measures 5 1/2" x 5 1/2"
Who can resist a patriotic snowman? 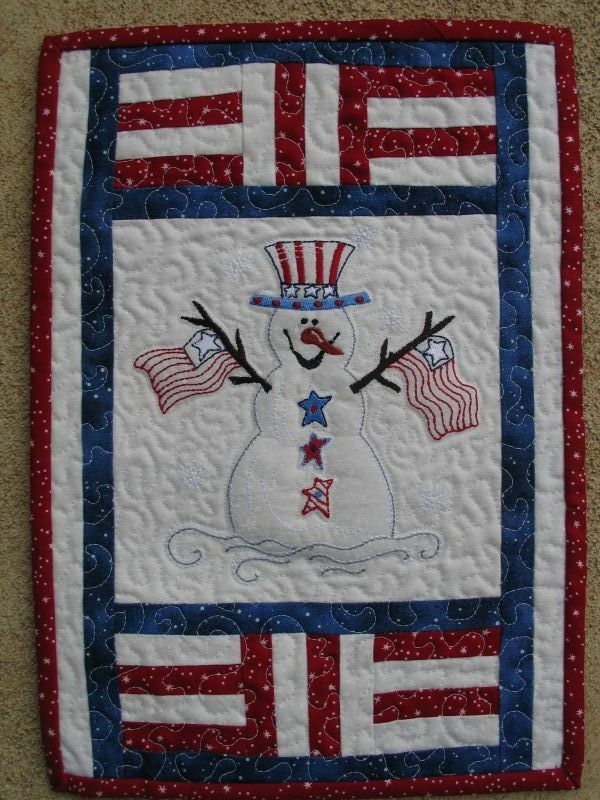 Hang this in any small space that needs a little red, white and blue. Use your embroidery machine and make it quick! If you love gingerbread, you will love this sweet little ginger. Use your embroidery machine and make it quick! 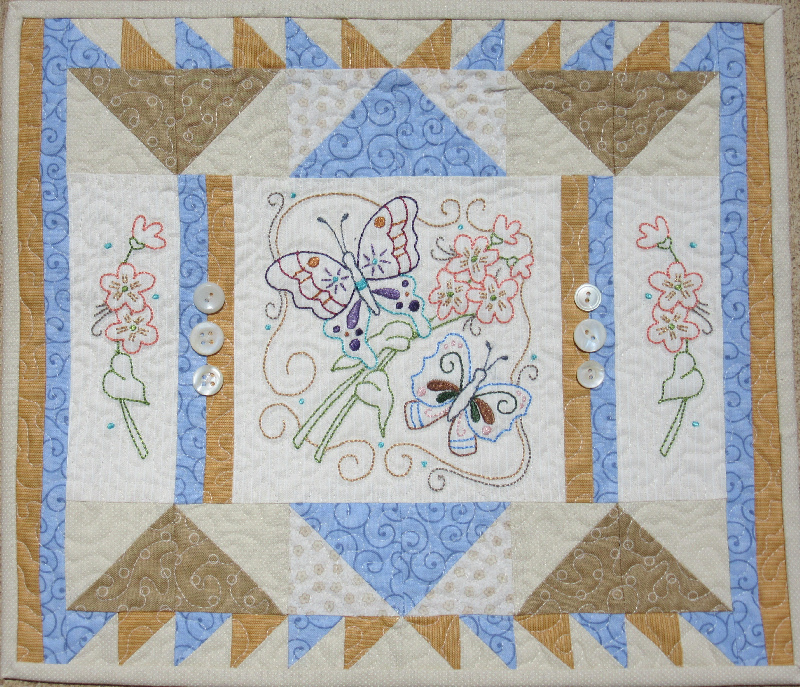 Say hello to spring and the sweet lady bugs with this mini quilt! 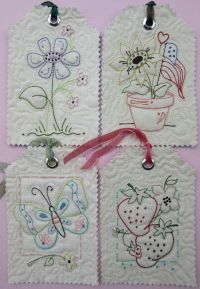 Use your embroidery machine to stitch these quick designs in 3 sizes. 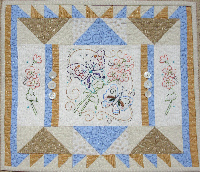 The piecing pattern is easy to complete!